How Is Your Tic Tac Toe Game? Hey stamping friend! How is your Tic Tac Toe game? Are you in the mood for a playing along with the Paper Craft Crew? We have a great challenge for you this week, with PCC 267 – Tic Tac Toe challenge. Joining the challenge is easy! First, select one row. It can be either horizontal, vertical or diagonal. Then, create your project using each of the 3 items in your row, plus any other products as needed (but try not to overwhelm the 3 important items). If you need some inspiration before you create, hop over to our Paper Craft Crew challenge page, and check out what we in the Design Team have made. We’re here to help inspire you! I chose to go with the top horizontal line, so you’ll see that my card includes ‘holiday celebration’, ‘copper’ and ’embossing’. I love the look of this sweater-wearing reindeer in copper! 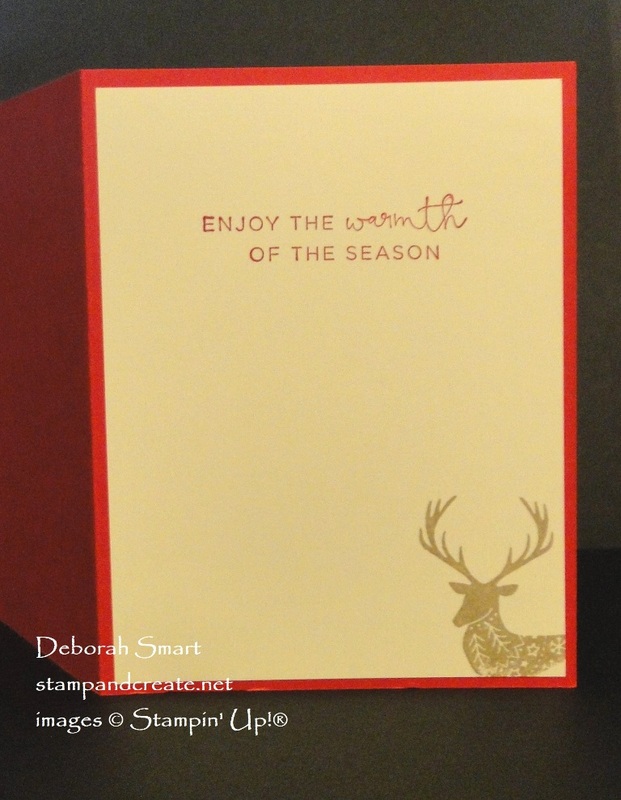 The card base is Real Red cardstock that measure 8 1/2″ x 5 1/2″, scored and folded at 4 1/4″. Cut a panel of Very Vanilla cardstock at 4″ x 5 1/4″. Ink the patterned deer image from the host set Merry Patterns in Versamark ink, and stamp onto the bottom right corner. Cover the image with Copper Embossing Powder, and set using the Heat Tool. Stamp the sentiment in Real Red ink, above the reindeer. Use the Big Shot, Copper Foil Sheet and Seasonal Layers Thinlits to die cut the 3 different snowflakes; cut 3 of the smallest snowflakes. 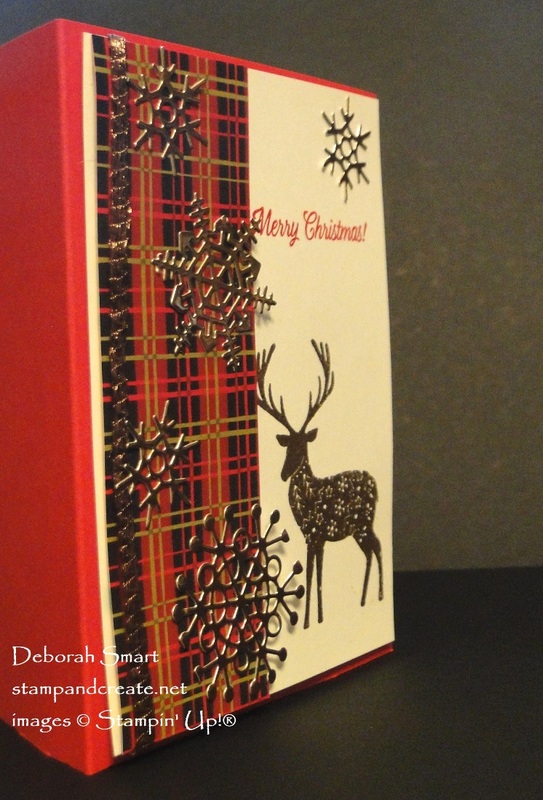 Next, cut a piece of the plaid pattern from the Christmas Around the World Designer Series Paper. It should measure 1 3/4″ x 5 1/4″. Finally, cut a 6″ length of the 1/4″ Copper Trim. First, attach the panel of Christmas Around the World DSP to the left side of the Very Vanilla panel, with the Multipurpose Liquid Glue. Then wrap the 1/4″ Copper Trim vertically around the left side of the DSP – see the picture above for placement. Hold it in place in the back with the Tear & Tape. Finally, use the Liquid Glue to attach the snowflakes on the card. 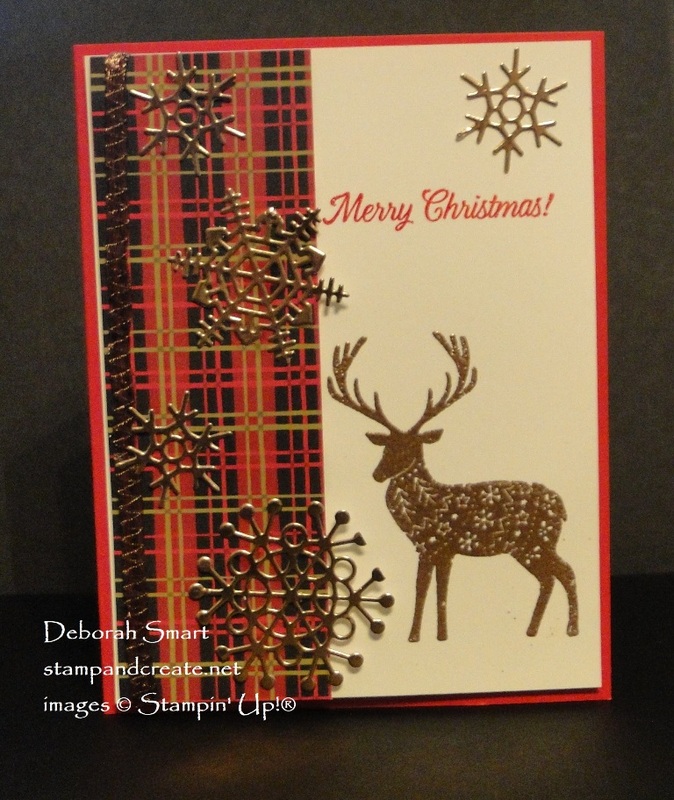 Once your front panel is complete, attach it to the card base with Stampin’ Dimensionals. Yes, I know I’ve said it before, but you can’t forget to add a little extra to the inside of the card, too! Here, I’ve stamped the sentiment in Real Red ink onto the Very Vanilla panel. Then, I’ve stamped just the head of the Patterned reindeer in Crumb Cake ink in the bottom right hand corner. Once your card is ready, grab the link from the Paper Craft Crew challenge page, and use it for linking your card. I can’t wait to see what you design! While you can no longer get the Merry Patterns stamp set (it was a limited time host exclusive set), you can get the rest of the supplies from my online store. Click either the product images below, or my signature. You’ll go directly to my store, which is open all day, every day. Shop when it’s convenient for you! Previous Previous post: Turn-back Tuesday! I love the line you selected! And the little deer peeking out on the inside is adorable! So glad you like my copper deer, Buffy! It’s such a warm colour, isn’t it? I love the copper deer! That DSP is gorgeous too. What a lovely card.